Within moments of arriving in Boston, I made my first friend. As the taxi driver set down my suitcase at the curb of Irving House, I saw her standing outside, her brown hair riffling in the January chill. We soon found out we were both new students in the same MFA program. I was overjoyed. Flying in from Seattle, I knew no one. Now I’d have someone to walk to school with over the next ten days of our residency. “I’m going to dinner. Want to join me?” I asked. Her eyebrows flew up – a hint of surprise – but I dismissed my misgivings when she quickly said yes. After I lugged my suitcase upstairs, we set off. “Seafood okay?” I asked, and it happened again – the eyebrows, the quick nod. I passed it off as a facial tic. I’d already scouted a restaurant that served fried clams, a favorite throwback to my Boston childhood. She ordered chicken strips. We talked about our writing backgrounds and traded stories about our families. We walked back to Irving House, said our goodbyes and see you in the mornings. I had inadvertently triggered the part of her limbic system that I now recognize as “the pizza place.” It’s the jumping off point where risk meets reward. My head spun, but I kept quiet. As an engineer, I felt totally outflanked, trying to feel my way around this literary world. I wasn’t nearly as well read as my classmates. Had I heard her correctly? These non-linear discussions appeared to be a hallmark of right-brain creative thinking. But when people started talking over each other, I sighed in relief. I hadn’t missed anything: we were actually talking about pizza. There was a brief silence, then peals of laughter. 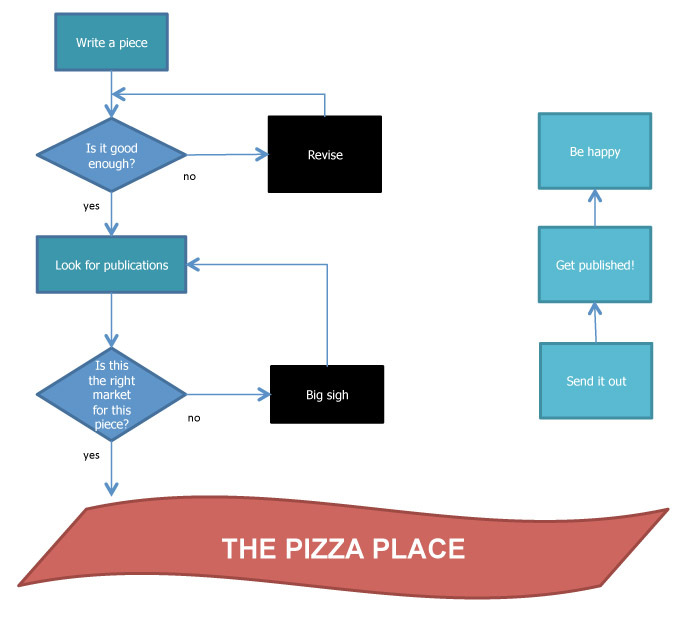 You’ll note there’s no connection between the pizza place and the world of publishing and being happy. Early attempts to get past my pizza place simply weren’t sustainable. Sneaking to the edge and flinging a piece of writing out into the world terrified me. Was my work good enough?Am I worthy?Self-doubt bubbled like acid just below the surface. I needed to get a hold of myself. I sat with that powerful idea. Writing as a way to gain control over chaos. Claiming my own authority. So now I confront my pizza place. Rejection may overwhelm at times. I may fall into the infernal do-loop of editing and resubmitting. But I stay disciplined. Setting bricks – sending pieces out into the world. Taking measure. Believing the bridge is part of my journey.